Battery Powered Ride On Cars & Trucks for Kids. One of the most popular toys for kids of almost any age are those with wheels—bikes, scooters, tricycles, and especially powered ride on toys that allow them to pretend to take to the road the way they see mom and dad do everyday. These electric cars become the luxury vehicles for the elementary school set—and Injusa provides battery powered ride on toys and ride on toys for a wide variety of ages. 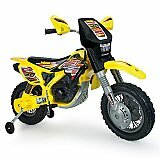 Extreme Motor Sales offers Ride on toys, Power Wheels, Battery Operated Vehicles in Orlando, FL.